Image: @RevProUK. Report submitted by reader Nick Wright. This was a fun match. Scurll had the crowd in the palm of his hand, with them loving and hating him whenever he wanted them to. There were lots of good comedy spots and they both got their big moves in before Scurll won. Liger was really over, though everyone expected Bodom to move on given that he's RevPro's British Cruiserweight Champion. But to the delight of the crowd, Liger shocked Bodom within three minutes and won with a brainbuster. You could tell that this was going to go long after the last match, and it ended up being 20 minutes of intense action. KUSHIDA is just so awesome and O'Reilly played a subtle heel in this one. It had lots of chain wrestling and back-and-forth action. KUSHIDA hit the Back to the Future to win a high-quality contest. This was another fun match that had a lot of comedy, especially around Taguchi's posterior-based offense. There was a great bit where Taguchi was running the ropes for a lariat and Ospreay kept ducking. Taguchi eventually got tired and Ospreay gave him a Red Bull, then he ran the ropes again and Ospreay ducked again. Ospreay ended up advancing after hitting the OsCutter. The match had decent action, with Champion playing a good face in peril. But there was a big gulf in class and the Tempura Boyz picked up the win with a combo piledriver. Another decent bout here. Takahashi is great and so charismatic. It ended when Banks got misted by BUSHI and the ref called for the bell. There was brutal, brutal action in this one. It had one of the most electric starts that I've ever seen. There was a chop fest and Ishii followed with an awesome German suplex, then Riddle popped up and Ishii gave him a German suplex of his own. Ishii popped up right after and the place became unglued. There were so many chops, forearms, big suplexes, and it was utter carnage. Ishii eventually won with a brainbuster. They have to have a rematch because everyone loved it. You could have expected this to have a hard time following the last match (and there were a few technical issues with the introductions), but it was a great contest. There were lots of clever spots. Scurll superkicked Liger about five times to leave him out of the action for the majority of it. Scurll first eliminated KUSHIDA to the disappointment of the crowd, but they were picked up by a few fantastic sequences between Ospreay and Scurll. Eventually, Scurll pinned Ospreay to leave him with a wounded Liger. 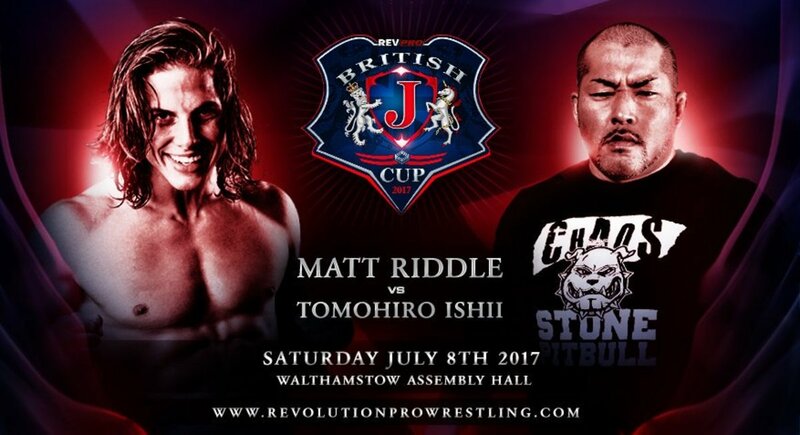 Just when you thought Liger was done, he found something extra and emerged as the first winner of the British J-Cup after a Liger Bomb and a brainbuster. Bodom attacked Liger after and then had a pull-apart with the legendary Marty Jones (who was giving Liger the trophy and had given a great speech earlier in the night). Half of the roster for the show came out to get Bodom out of the ring. It will be Bodom vs. Liger at RevPro's Summer Sizzler in August.